A vigil in support of Andrew Chan and Myuran Sukumaran has heard emotional statements from the pair, who say the “compassion and kindness from people forgiving our stupidity” has made them feel “truly blessed”. Indonesia has delayed transferring the Bali Nine pair from Bali’s Kerobokan prison to the island where they are due to be executed, and says it is “almost certain” the Australians will not face the firing squad this month. On Wednesday night vigils were held across Australia in support of the Australians, including at Toongabbie in western Sydney, which was read a letter from each of the men. “Please tell everyone at tonight’s vigils in Australia that we are amazed at how kind and supportive everyone has been and it has touched our hearts,” Sukumaran said, in a letter read by The Chaser’s Craig Reucassel. 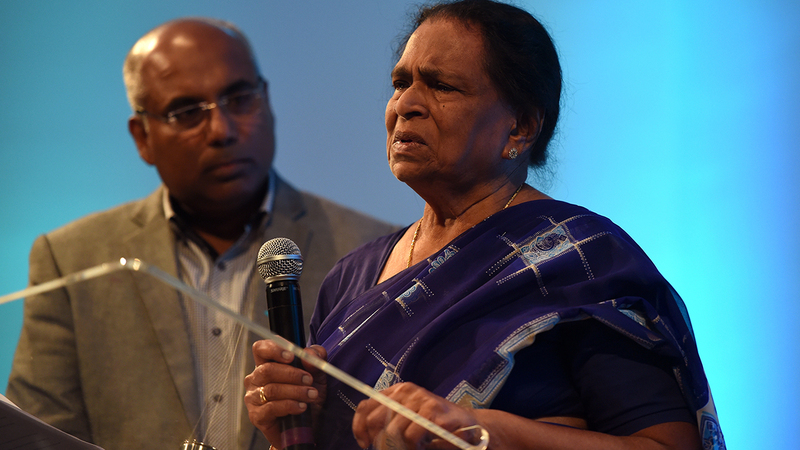 “It has helped our families so much. It makes us even more determined to be better people and to do more to help people; to show more kindness like that which everyone has given us, especially our families. “Whatever happens, I know that me and Andrew are good people now and that even though we’ve been in prison with a death sentence, we have been truly blessed. “Blessed to have beautiful family and friends. Blessed to have received so much compassion and kindness from people forgiving our stupidity and supporting our change for the better. Reucassel also read a letter from Chan to the service. “I would like to thank you for attending this vigil on the grounds of mercy and hope,” he said. “This campaign is more than just about myself or Myu. It represents a second chance and forgiveness. It represents kindness and help for those in helpless situations. The Toongabbie vigil was organised by artist Ben Quilty, who has befriended the men and said he could “quite literally flood this place with tears”. “Maybe because I have been spending a bit of time in a prison lately I felt a bit nervous calling Blacktown police to tell them about tonight. But as soon as I told them what I was ringing for instantly I heard a compassionate voice down the phone,” he told the gathering. Quilty said he hoped to help raise awareness of the pair, and “bring compassion to their story”. “I’ve felt that their families have faced some pretty negative stuff. I wanted that to end, and I wanted some quiet for them to get through this very difficult period, that’s really my aim,” he said. 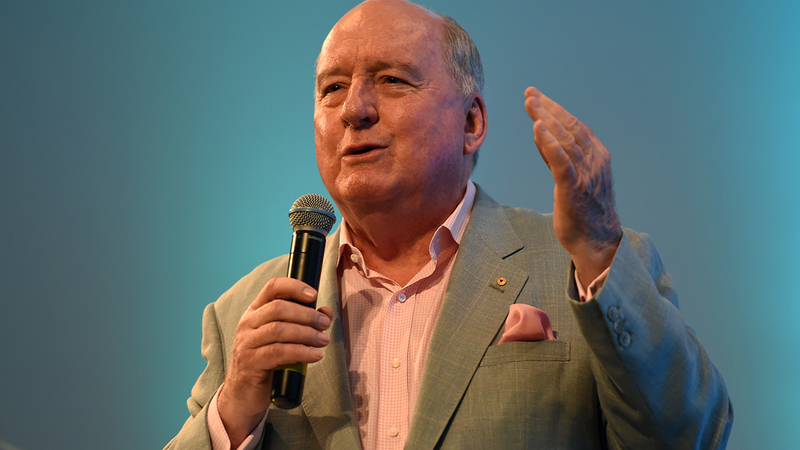 Broadcaster Alan Jonestold the crowd that “we stand for mercy because we are all imperfect”. “We’re all fairly ordinary people at the end of the day. But in a way what we’re saying to the world in this little place at Toongabbie tonight is that one aspect of us is full, and it’s our heart,” he said. “To have a heart that is full and compassionate is to be a real human being. “These two young men are the same as other Australians, other Indonesians, other Americans. They are our brothers. When we ask for mercy and clemency we seek it for others in a similar predicament. We know for example there are Indonesian families in exactly the same predicament that these families are in. Vigils were also held in cities including Brisbane, Adelaide, Perth and Melbourne. 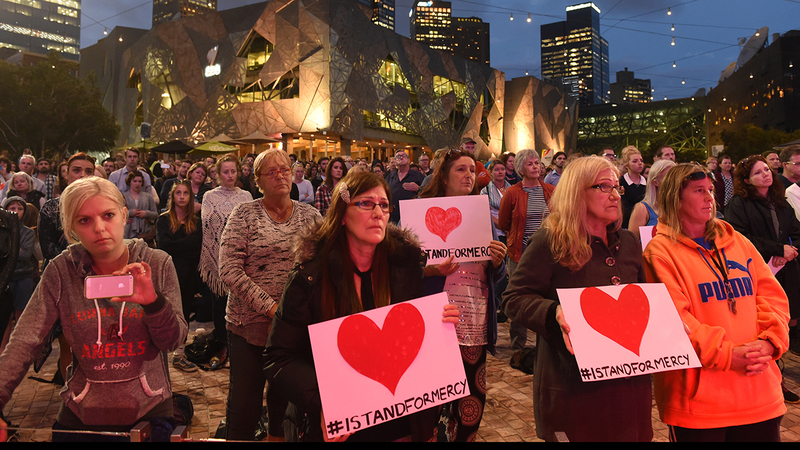 Opposition Leader Bill Shorten attended the Melbourne vigil, where singers Clare Bowditch, Missy Higgins and Bob Evans performed. Addressing the Melbourne vigil, he said he had visited Chan and Sukumaran in jail in Bali several times and was in no doubt the pair had redeemed themselves. He said he kept hoping for the best outcome, that Chan and Sukumaran’s lives would be spared. “We’ve all got a chance to pull back from what is such a final, complete and what would be a tragic outcome,” he said. A minute of silence was held outside the Supreme Court in Adelaide by members of the legal profession. “Regardless of whether you are a person who supports the death penalty or not, we all feel that in this case, in these two young men’s cases, there’s a very strong argument for showing mercy, for showing leniency and allowing these people to live,” Claire O’Connor from the state’s Council for Civil Liberties said. In Perth, Federal Labor Member for Fremantle Melissa Parke said there was a deeply felt commitment by Australians that the death penalty was wrong, regardless of who the perpetrator was, their nationality or the nature of their crime. “The application of the death penalty is the practice of torture,” the former human rights lawyer said. Doctor Ameer Ali of Murdoch University said to kill one human life was to kill humanity. “To save one human life is to save humanity,” he said. Earlier on Wednesday Foreign Minister Julie Bishop said she was able to speak directly to Chan and Sukumaran over speakerphone. “I think the delay in the decision to proceed with the planning of these executions came as a great relief to them and obviously to their families,” she told Fairfax Radio in Melbourne. Prime Minister Tony Abbott said it was an encouraging sign that Indonesia had delayed moving the pair to their place of execution, but that it was not an indication of any serious prospect of clemency. He urged Indonesia to remember the contribution Australia made to the tsunami relief effort and to spare the lives of Chan and Sukumaran. “When Indonesia was struck by the Indian Ocean tsunami Australia sent a billion dollars’ worth of assistance,” he said. But Indonesian foreign ministry spokesman Armanatha Nasir warned threats were not part of diplomatic language. “No-one responds well to threats,” he said. Chan and Sukumaran are on death row for attempting to smuggle drugs to Australia in 2005 as part of the so-called Bali Nine group. Legal officials from several parts of Indonesia met in the capital Jakarta on Wednesday to discuss arrangements for moving several prisoners to Nusa Kambangan island, where they are expected to be executed. The attorney general’s office said it was the latest preparation but did not provide any further details or dates.